TEST RIDE: REAL RYDER REVOLUTION – DETROIT SUBURBS / BIRMINGHAM – …it's all about Studio Cycling! Spending a few days in the Detroit area with my wife and daughters…so I had to squeeze in an early AM workout at another indoor cycling studio. This time, one of the more unique “rydes”, because of the Real Ryder bikes. Similar to most other stationary bikes in many ways with the added pivoting frame that lets the rider rock from side to side. This feature makes for a whole new experience and an intense full body workout. While the rest of the family slept in, I drove into Birmingham before sunrise to make it to the 6AM class with Debra and a smaller class of 10. This location is one of four R3 studios from Detroit to Chicago (other studios in West Bloomfield, Ann Arbor and Chicago). The R3 website is pretty basic, with a short video and links to class schedules for all four studios (see link below). Participants can sign up weekly for their favorite class/instructor. The drive to Birmingham from Clawson was short and quick at 5:30, so I arrived early and Debra had everything ready for the 6AM class in plenty of time. Getting registered as a first timer and acquainted with the equipment was straight forward with Debra’s help. I took some time before and after class to check out the space…plenty of room and all the amenities: lockers, men’s/women’s bathrooms and a unisex changing/shower room. The studio was set up for 30 participants with a good amount of space between bikes…necessary to avoid a collision of these pivoting cycles. Towels and water are available for purchase if you don’t bring your own. Since my own water bottle didn’t fit in the drink holder, Debra provided a bottled water at no charge. We started at the scheduled start time…lights dimmed and black lights turned on for our smaller group of 10. Bikes didn’t come with any tech features or computers to display RPM, gear/resistance, watts, Kcal, heart rate, distance traveled or elapsed time. Since I’ve taken a FlyWheel class and use a Keiser M3 (with computer) I really miss having the performance metrics. The class went by quickly as I was taking in the full motion experience of the Real Ryder equipment (it takes a couple classes to fully adjust to the full motion equipment). Debra got us going with a short warm up and right into a series of sprints, hovers, hill climbs…and lots of core-engaging side to side movements…in and out of the saddle. Music for this ride was a great mix of current/pop tracks and the sound system was solid. In addition to the intense core workout, there was more upper body work at the end of the class. A variety of seated push ups off the handle bars to work triceps and chest. No weights or resistance bands used for this part of the class. Clearly not your Spinning (r) format, as several contraindicated movements (isolations, extended high speed work, upper body strength work, hovers, tap backs, single-handed and no-hands cycling, etc.). At the end, we had some time for stretching on and off the bike. Debra was awesome in all aspects! She even provided a birthday cupcake treat after class for two regulars celebrating the start of their birthdays with a great workout. It was an intense and quick 45+ minute ryde! For R3 newbies, the first ride is full price ($16 as of May 2014), but the second visit is no charge. Needless to say, I’ll be back again soon. A student special was recently announced for $10 rydes, limited to certain days / times. 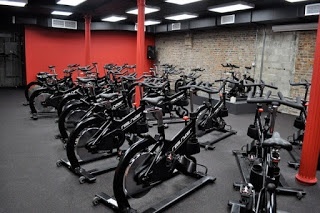 Overall, R3 offers the most unique indoor cycling experience with the use of the Real Ryder cycles. While not true to the Spinning (r) program, R3 classes have more options for an on-bike workout that will torch your core. Customer service was very good, based on my limited first time experience with Debra and the Birmingham studio. The facility was simple and clean…equipment was in good condition and working order. See more at their website (http://realryderrevolution.com), Facebook, Twitter. Thank you for the kind review. Look forward to having you and your daughter Ryde with me in a Tuesday $10 student class. If you have any further R3 questions just drop me an email. UPDATE: The weekend schedule in the Detroit area was extended another day…and my daughter and her friend were up for a Sunday AM cycle class, so I joined and we sweat it out at Mary’s 9:30 45-minute CHALLENGE RYDE. Evidently 9:30 on a Sunday morning works better for Birmingham folks than Fridays at 6AM…class was nearly full at 25+. Another great class…instructor, music, intense workout and overall experience at the Birmingham Real Ryder Revolution studio. Thanks to the team at R3!